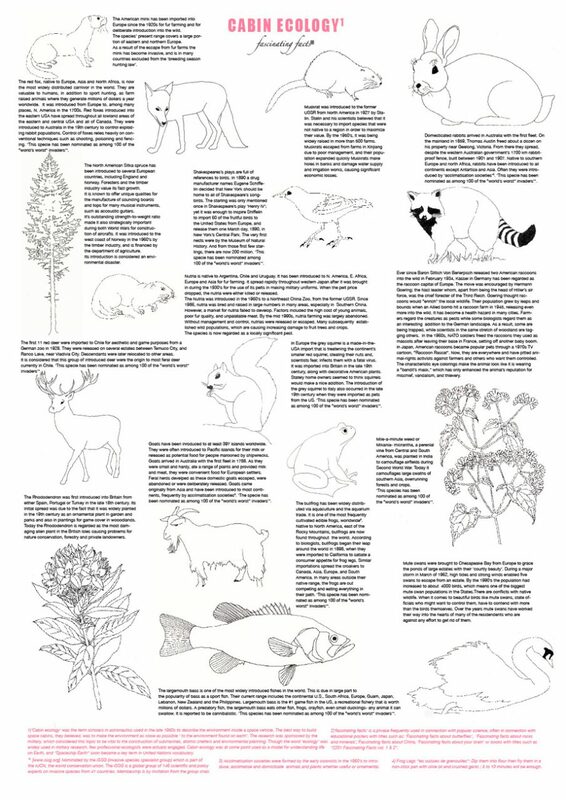 The poster Cabin Ecology (2006) deals with the rhetoric of labeling and classification systems within natural science as well as popular science, including its political interactions. Specifically the idea of invasive species, which is the defined terminology used for alien species considered a threat to the environment. There is an international organ with selected members whom decides what species are termed ‘invasive’. The choice of species on the poster includes defined invasive species though only those introduced at some point deliberately rendering the definition somehow contradictory. Their descriptions are presented solely as narratives including historical information and myths reflecting human interaction- no biological information of the specie included. the introduction of American raccoons to Germany encouraged by Hermann Göring, and how Stalin initiated the introduction of the muskrat to the USSR. The style of the poster refers to popular science posters and educational posters. The title Cabin Ecology refers to a term used in the 50s by astronautics to describe the environment inside a space vehicle. An attempt at recreating the environment on earth. Cabin ecology was at some point used as a model for understanding life on earth. The idea of earth being a human controllable enclosed environment became an idealized and utopian idea.